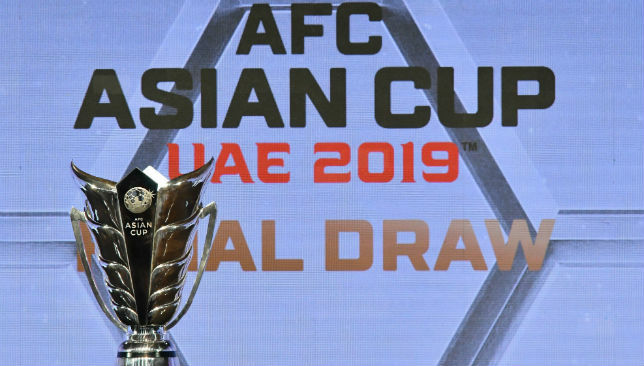 Hosts UAE have already made Asian Cup 2019’s knockouts. Now has come the time to complete their job against Thailand and top Group A.
India were brushed aside 2-0 last Thursday at Zayed Sports City, in a match that was closer than the scoreline suggests. This followed a 1-1 opening draw with Bahrain. Monday’s opponents Thailand will have their eye on second spot after caretaker coach Sirisak Yodyardthai beat Bahrain 1-0. This followed the 4-1 humiliation at India’s hands that cost Milovan Rajevac his job. Optimism was at a low ebb for the hosts coming into the tournament. Troubling results, allied with a lack of goals, meant that enthusiasm was tempered. But victory against India represented an improvement – somewhat – in performance and certainly in the result. These steady steps are all part of the process for coach Alberto Zaccheroni – and he should know after winning the 2011 edition with Japan. “First of all we are so happy that we won the last match and nearly qualified for the last 16,” said the 65-year-old. “But our focus will be on achieving the top spot and qualifying without looking or considering the result of the other match. Sticking to this plan is worth the effort against the Thais. First place would represent validation, if not a noticeably easier route through to the deep end. From the moment 2015 AFC Player of the Year and creative heartbeat Omar Abdulrahman went down with a serious knee injury in October, Khalfan Mubarak became a figure of extraordinary importance for the UAE. Zaccheroni’s 4-3-2-1 formation has been crafted with the Arabian Gulf League assist king in mind. 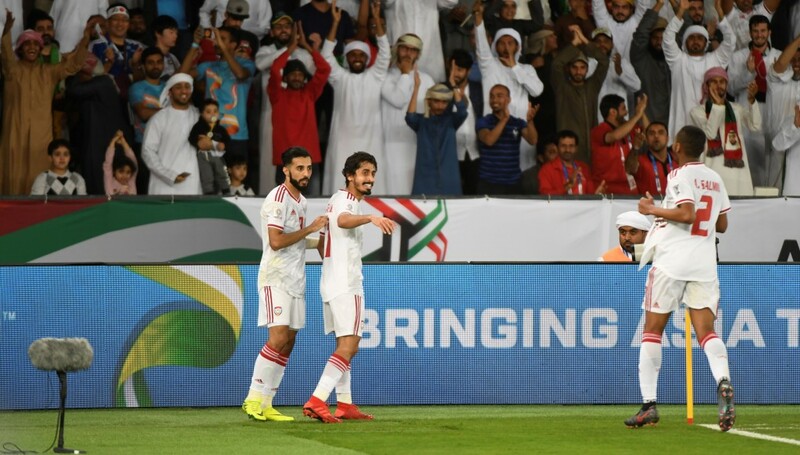 Just like his team-mates, a disappointing opener against Bahrain was forgotten against India – and for Mubarak, a staggering solo goal was the highlight. This is why the facial injury sustained in the second half against the Blue Tigers is such a problem. Extensive bleeding from the nose and his hooking on 85 minutes exemplified its severity. But the 23-year-old trained at the Hazza on Sunday and should be available. But would a rest be advised, ahead of the round of 16? With no like-for-like replacement in his squad, a big call awaits Zaccheroni. Several years of steady progress have threatened to come to a halt for the War Elephants. They went within seconds of beating the UAE in World Cup 2018 qualifying, the 1-1 draw in Bangkok during June 2017 effectively killing Whites hoping of qualifying. Since then, diminutive playmaker Chanathip Songkrasin has also become a star in Japan. But Rajevac’s dour nature put the handbrake on their advancement. Semi-final defeat in the winter’s AFF Suzuki Cup was a harbinger of what was to come in the UAE. The talent, however, remains in the ranks. Caretaker Yodyardthai’s five-man defence sparked an upturn against Bahrain and he’ll now hope to stun the hosts. 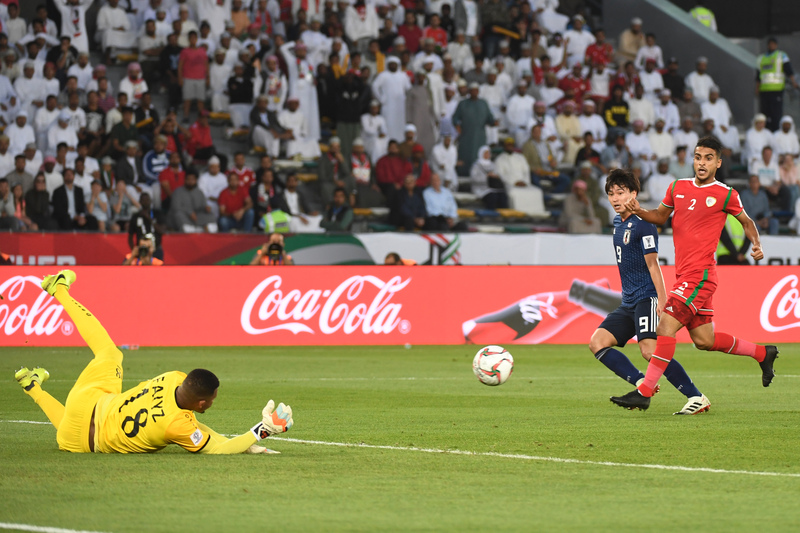 Midfielder Genki Haraguchi slotted in a first-half penalty to earn wasteful Japan a 1-0 win against Oman and entry into the Asian Cup’s round of 16. 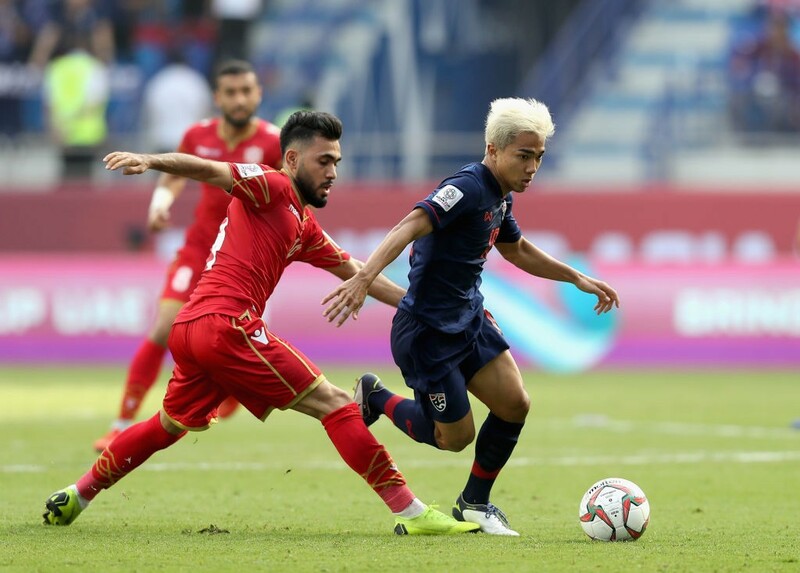 All the entertainment at Zayed Sports City was packed into an opening period during which forward Takumi Minamino spurned four glorious opportunities. The only goal would come from the penalty spot after the on-rushing Haraguchi, himself, was clumsily felled by Raed Ibrahim Saleh. Another decent display and another loss. Oman will rue a decision on 45 minutes not to punish full-back Yuto Nagatomo for a handball from playmaker Salah Al Yahyaei’s stinging shot, plus the sight of forward Muhsen Al Ghassani’s shot trickling past the far post that preceded it. The Gulf Cup champions – still without a point – must now dust themselves off, defeat Turkmenistan on Thursday and hope it is enough to claim one of four best-third-placed finisher spots. It should be. When the Japan team sheet dropped, so did a number of surprises. Portimonense goalkeeper Shuichi Gonda kept his place after two awful errors in the 3-2 victory against the Turkmen, Werder Bremen forward Yuya Osako watched on from the bench even though he scored twice in that match and Urawa Red Diamonds veteran Tomoaki Makino was sat down behind him. This afforded Sint-Truden’s Takehiro Tomiyasu the chance to drop back from midfield and play in his favoured position at centre-back. The 20-year-old was not troubled defensively, plus delivered an outstanding cross-field ball for one of Minamino’s many misses. He could add a new, and necessary, dimension to Samurai Blue’s laboured play in the UAE. Why the wait for VAR? The video-assistant referees will only be unleashed at the Asian Cup from the quarter-finals. This will be painful reminder for Oman. Saleh’s swipe at Haraguchi for the decisive penalty could have gone either way on review, but there could be no doubt about Nagatomo’s foul play. Red Bull Salzburg forward Minamino could have, conceivably, walked off at half-time with four goals to his name. With Osako and Yoshinori Muto also out of form, Japan could be firing blanks in the knockouts. 7th min CHANCE: Minamino produces a low save from shot stopper Faiz Al Rushaidi. 12th min CHANCE: Minamino drags another effort wide. 25th min CHANCE: Minamino shoots straight at the busy Al Rushaidi, Ritsu Doan’s follow-up is blocked. 26th min GOAL: Minamino’s shot from a one-on-one is repelled, Haraguchi eventually races onto a bouncing ball and is summarily booted by Saleh. The midfielder dusts himself off to score from 12 yards. 45th min PENATY CALL: The furious Oman players crowd the referee after Al Yahyaei’s shot appears to have been illegally blocked by Nagatomo’s hand, but only a corner is given. Will passive play keep paying off? Japan are, seemingly, not here for our entertainment. They dominated possession (66/34 per cent) and produced 457 passes. But after a flurry of activity in the first half, all entertainment ebbed away after the break. This approach seemed preordained from new head coach Hajime Moriyasu. Can they keep on doing just enough in the Emirates under him? If Japan had been ruthless in front of goal, we wouldn’t be talking about a hard-luck story. Oman couldn’t do enough in a quiet second half and they need a performance against the Turkmen. Japan must hope they grow into the competition. At present, they are being outshone by Iran and Saudi Arabia. A bravura display would do nicely to wrap things up against Uzbekistan. The Asian Cup has turned out to be an extremely exciting affair, filled with some entertaining football and flavoured with a few upsets. Among the six groups, Group A has been the pick of the bunch when competitiveness and unpredictability is considered. UAE were held by Bahrain in the opening day fixture and India thrashed Thailand 4-1 the next day. 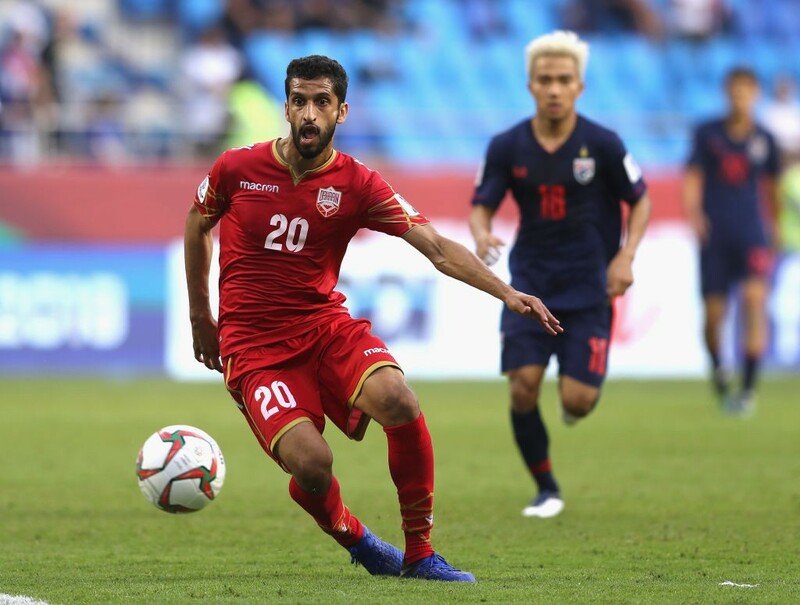 In the second round of fixtures, Thailand edged Bahrain 1-0, while UAE recorded their first victory of the tournament after recording a 2-0 win over India. The permutations for qualification to the next round is not as simple in Group A as it is for the other group. So, we decided to analyse the scenarios in this group and discuss what each team must do to qualify to the knockouts. Note that four of the best third placed team will be qualifying apart from the top two. Given that Group C and Group D have Kyrgyzstan, Philippines, Vietnam and Yemen, who have all failed to collect a single point after two games and have recorded a poor Goal Difference (GD), the third placed team in Group A have a bright chance of qualification. Khalfan Mubarak celebrates his goal. UAE are favourites to top Group A, but it’s worth noting that the hosts can’t take the fixture against Thailand for granted as the War Elephants will be fighting for a win in order to qualify. The hosts can qualify as group winners if they beat Thailand. They can also win the group if they draw against Thailand and India fail to beat Bahrain. In the scenario where UAE fail to beat Thailand and India beat Bahrain, the hosts will be qualifying as runners-up. Should Thailand and India win their games, UAE will be placed third. But four points is enough to ensure qualification as one of the best third placed teams. Therefore, UAE have qualified for the knockouts, but their position will be determined on Monday. 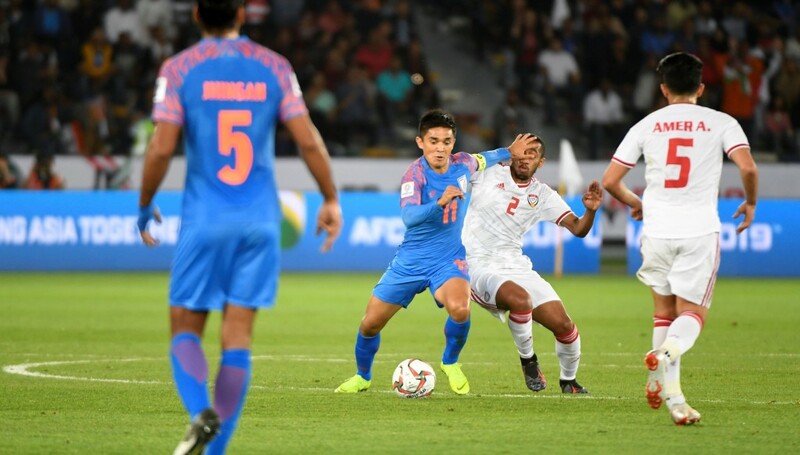 Sunil Chhetri battles with Ali Salmin. The Blue Tigers have a great chance to progress to the next round of the Asian Cup. Qualifying as group winners is not in India’s hands alone. The Blue Tigers must beat Bahrain and hope that Thailand defeat UAE in order to win the group. If both India and UAE win their games, India will be qualifying as runners up. Also, if UAE win their game against Thailand and India split points with Bahrain, the Blue Tigers will finish as the second placed team in the group. A draw in both the games will also lead to India qualifying as the runners-up. A draw is enough for India to take them through to the next round. A defeat could also result in qualification, subject other results across all groups. A Thailand and Bahrain win are the only combination of results that can ensure that India finishes fourth. The War Elephants too have a good chance of featuring in the last 16, thanks to their narrow win over Bahrain. It’s unlikely that Thailand will top the group as they will have to defeat UAE to do so and hope that India don’t beat Bahrain. This seems like a plausible scenario. A win each for India and Thailand would send the latter through as runners up. Should Thailand and UAE split points and Bahrain defeat India, the War Elephants will qualify as the second placed team. A draw against UAE and India beating or drawing against Bahrain will mean that Thailand will qualify as one of the best third placed teams. Thailand can qualify even by losing against UAE if Bahrain don’t beat India and the results in other groups are in their favour. Only if Thailand and India lose their respective games, will the former be eliminated from the competition with immediate effect. Bahrain’s qualification scenario is straightforward when compared to any of the other teams in the group. Bahrain can’t qualify as group winners. Bahrain will have to defeat India and hope that UAE defeat Thailand, in order to qualify as runners-up. No other situation can ensure this. Bahrain will have to win their game to qualify as one of the best third placed teams. The result in the other game will be immaterial. Simply put, a draw or defeat against will eliminate Bahrain from the tournament.